"The original meaning of the Greek word poetu is to make. That is the beauty of this craft: to make the poetical, indefinable quality of music possible by creating an instrument which has that potential." Saskia Schouten was born on the 16th of February 1961. After completing her secondary school education, she was apprenticed to Paul de Froe, a violin maker in Amstelveen for one year. She had been studying the violin from age 9 and Paul de Froe introduced her into the world of violin-making. At the same time she started learning Italian. Saskia:"I have made my first violin when working with Paul de Froe. I still have it." At the age of 19 Saskia moved to Italy to study at the International Antonio Stradivari School for Violin-Making (IPIALL) in Cremona. Saskia:"Cremona is the world centre of violin-making.When I was 17, I already was amazed by the way these instruments were built and I often wondered how it was possible that they all sounded differently. So my interest in the way they were constructed grew gradually and then I decided to start learning how to make them myself." In 1982 Saskia worked with four colleagues in Tuscany for a year. Then she interrupted her studies in Cremona and joined Peter Pots in Palermo to restore the instruments of the local conservatory. "There was a museum which was in a very bad state with all kinds of instruments, and we were to repair them. We did that for two years." Having acquired this practical experience she went back to Cremona and received the Maestra title at the IPIALL in 1986. She subsequently returned to the Netherlands and settled in Den Bosch, where she specialised in making cellos and violas. Her instruments are played both by nationally and internationally renowned musicians, as well as by students at conservatories and by dedicated amateurs. In the past years she has also been building violins again and several of her instruments have been sold to the renowned Dutch Musical Instruments Foundation, who give instruments on loan to professional musicians working in the Netherlands. Geertje van der Linden, together with Frits Schutte the collection manager of the Dutch Musical Instruments Foundation, has to do a lot with instrument makers and also has frequent contact with Saskia Schouten. Geertje van der Linden explains:"We have bought 2 celli of Saskia, and a 3/4 cello (for children), 1 viola and 1 violin. We have already bought instruments of her in 1999, so we have a long-lasting relationship, for around 15 years now. Saskia makes beautiful instruments, they have a wonderful sound. Recently we have given on loan an instrument of Saskia to a student in The Hague, who chose explicitly for Saskia's cello. Saskia deliberates a lot with other musicians to reach a high level of quality in her instruments. She has a lot of friends in the musical world who have old instruments. As far as I know, she studies those instruments and so gradually she gains more expertise. Together with the musicians she is always looking after the best sound to get out of an insrument. One might say that Saskia is one of the leading contemporary violin makers in the Netherlands. 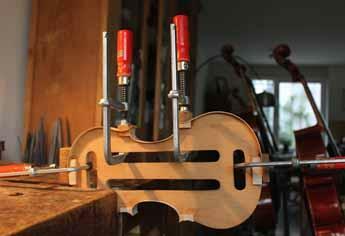 We have a select group of fine violin builders in the Netherlands. Our manager sometimes calls our foundation a marriage bureau; we have a lot of new instruments, but also very beautiful old ones, and it is of course fundamental that a certain instrument matches well with a specific musician. Like a kind of marriage. 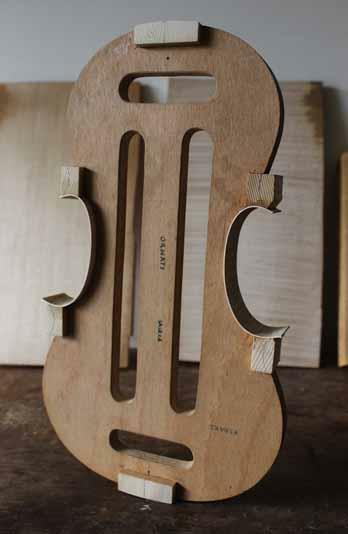 The whole industry of violin-making is quite unique. It is hard to tell what the secret is. It has a lot to do with the music played and the right feel. And also knowledge of instruments is important. 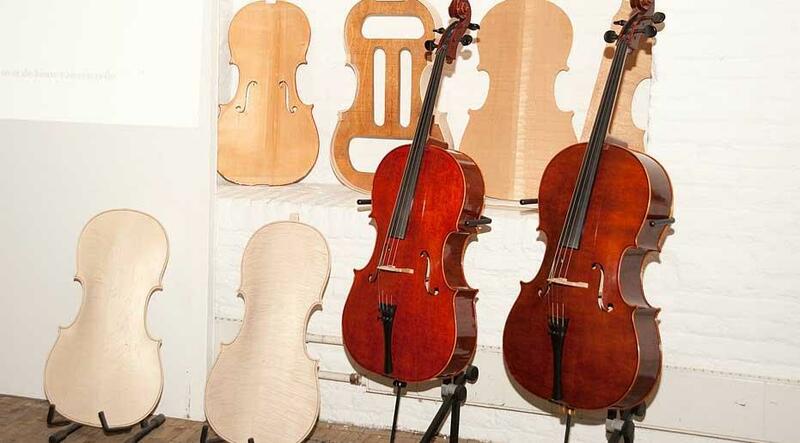 Everybody knows the fine, old masters, like Stradivari, and Amati, but it is always a mystery again to tell why their instruments are that beautiful and survive the ravages of time." 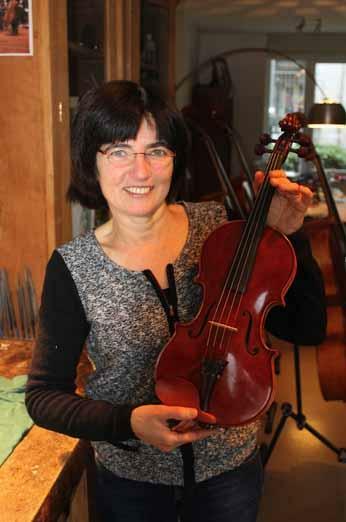 "Working for many illustrious musicians and conductors"
Saskia Schouten has been making violins, violas and celli for more than 25 years now. Besides making instruments, she also has been performing reparations, restorations and rehairing bows. Saskia specializes in optimal sound tuning regarding bridge and sound post. She also gives musicians advice about maintenance and strings. Saskia has been making instruments for many illustrious musicians and conductors and has a rich curriculum vitae. For instance Elias Arizcuren, the well-known cellist and conductor of the Cello Octet Conjunto Ibérco is full of praise about her craftsmanship. "Years ago, when I first played on a cello made by Saskia, I was very much impressed by her workmanship, I played it just for a little while, but I immediately fell in love with its large, noble tone. In 1998 Saskia made a beautiful copy of my Franscesco Ruggieri, 'ditto il Per' built in 1687. Since then many others of her students and former students ordered an instrument with her. 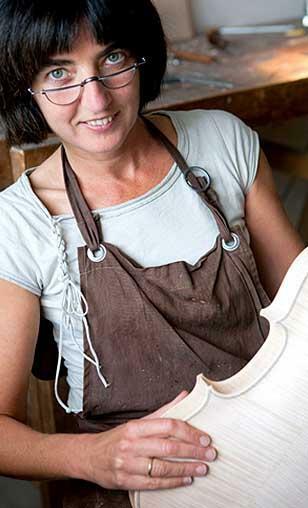 Saskia is a tremendous enrichment of violin making in the Netherlands. A number of her celli are played by members of the octet." Also the well-known cellist Marien van Stralen, who plays with the Rotterdam Philharmonic Orchestra, played on a Schouten cello in a new cello concerto, which has recently been composed. Instrument maker Saskia Schouten also works with so-called ZMT-tailpieces from the Slovenian double bass player Zoran Markovic, who designs special tailpieces for string instruments. Markovic: "The tailpieces that I use give the instruments a much clearer sound that carries more. Their projection is better." Saskia Schouten enthuses: "At the Storioni festval in 2013, I met Zorban Markovich, who is a double bass player, but his specially designed tailpieces generate more vibrations between the strings, the bridge and the sound post, the tailpiece creates more resonance throughout the whole body of the instrument. This results in more high tones and powerful bass sounds. 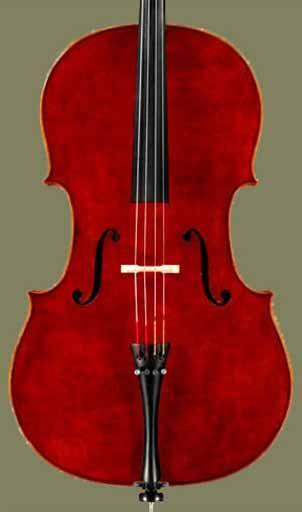 We tried the tailpiece right away on two of my own instruments, a viola and a cello. I have to say I am very enthusiastic about this tailpiece. For more information: www.zmtsound.com. Saskia:"Building the instruments is fascinating, there are many aspects in violin-making which make it so versatile and intriguing." "The ambassador of the Schouten cello"
Saskia Schoutern with one of her sefl-made instruments. One of the musicians who is very satisfied with a cello built by Saskia Schouten and which she bought in 2008, is Mayke Rademakers. Mayke forms a duo with pianist Matthijs Verschoor already for 10 years (see video clip below), and together they perform in the Netherlands and in other countries. Mayke Rademakers will release hir first solo CD this year. The Schouten cello is of great importance to her. She enthuses: "First I had a cello, on loan, of the Dutch Musical Instruments Foundation, but I always wanted to buy my own instrument. The idea in the classical music that only old instruments, like an Amati or a Stradivarius, can be of the highest quality, is predominant. But I do not agree with that at all. I do believe that contemporary violin makers make very good instruments. Violin-making actually is sheer donkey work, you know. Those violin-makers are working for hours, weeks, months, on their own, working, shaping, building the instrument. They do a good job actually. Saskia Schouten built my instrument and my instrument won a prize at the Cello Biennale in 2008 in Amsterdam. Five recenty-built instruments were compared to one old instrument and my Schouten cello was selected for producing the best sound together with an old Italian cello. The funny thing is that people often think that my instrument is an old Italian one, an Amati for instance, afterwards they say: 'You will no doubt be playing an old Italian, Madam.' But when I tell them that I am playing a newly built instrument of Saskia, they almost come to grief. It is really a pity that there is still such a myth around old instrruments. Because in general people keep on thinking that old instruments sound better than recently built ones, which is not the case. I am a kind of ambassador of Saskia Schouten. Her instrument is perfectly fitting with my character. It has been made of special wood. Actually the instrument of Saskia has been my source of inspiration to start playing the cello suites of Bach. You have to have a good feel with the instrument, you have to feel it click. This instrument gives me inspiration, every day again. It has a very good balance. It has rich high tones. A very warm, clear sound, one that I have always been searching for It was love at sight." Mayke Rademakers playing on a cello made by Saskia Schouten. Saskia Schouten:"An expensive violin does not automatically sound better." 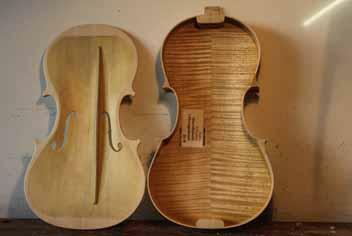 Saskia Schouten:"The type of wood of Mayke's cello was very interesting. It is maple wood and it has a very dramatic pattern, because it grew against the roots of the three, and it was beautifully flamed. I have made 7 copies of a cello of the famous Italian cellist Giovanni Sollima and this was the first one. But there is indeed a myth about old instruments. They just have to sound better. that is what people simply expect. That is also a question of money. A Stradivarius normally costst a few million euros, so people find it unbelievable that such an instrument wouldn't be the best. People tend to believe that everything which is expensive, is automatically better, which is not necessarily the case. There are old instruments which are very good, but also old ones that don't sound so good anymore."